Painted by John Howard Sanden before an audience at the Art Students League of New York, January,1990. he world of portrait painting lost one of its central figures on August 1, 2007, with the death of Marian MacKinney, President and Director of Portraits, Inc. in New York. She was 57. 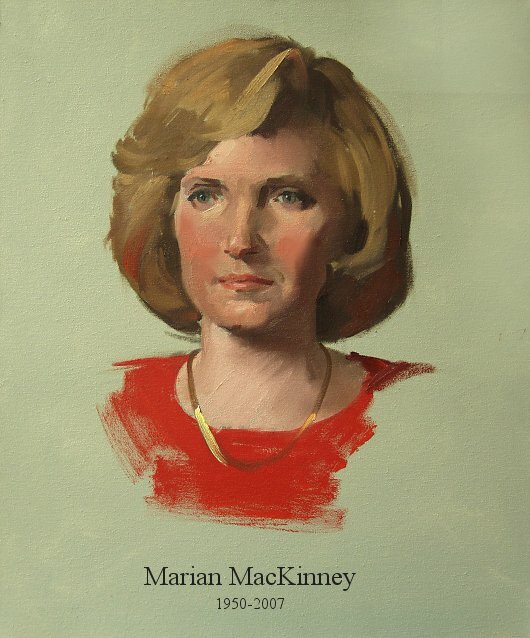 Marian MacKinney was known to virtually everyone in the field of contemporary portrait painting. Her gallery in New York, of which she was the owner, was the pioneer in the exclusive representation of portrait artists. Her roster included virtually every major portrait painter and sculptor in the world today. The clientele of Portraits, Inc. included the foremost names in the worlds of business, the professions, the arts, academia and society. Organized in 1940 by Lois Shaw (joined soon after by Helen Appleton Read), Portraits, Inc. is today probably the best known portrait brokerage in the world. The gallery's location in Rockefeller Center in midtown Manhattan was an example of Marian's courage and determination. She had moved the gallery there in 2005 after several decades on upper Park Avenue. Marian MacKinney joined Portraits, Inc. in 1986, became its director in 1988 and its owner in 1990. She had a high of view of portraiture and saw her own mission as a calling to restore portraiture to its historic position in the fine arts. It was my privilege to work with Marian for 21 years. During that time, we collaborated on countless projects. She was endlessly patient, considerate, and encouraging. She had a highly developed sense of style and appropriateness. Underneath it all was a current of purposefulness and determination which called forth the best in everyone who associated with her. It is not an exaggeration to say that Marian MacKinney was the central player in the international world of portrait painting in the 21st century. She will be sorely missed. education, recognition and fostering of young classical musicians.